Azure cloud service web roles have one peculiarity in regard to the way your code is hosted. The thing is although you have a single project associated with your web role it will actually be run in two separate processes. One process is WaIISHost.exe and it will run your RoleEntryPoint and this is where you can handle OnStart, OnStop and Run events. An instance of your role is running as long as this process is running. The second process actually hosts your web application. If you’re running on IIS it will be a worker process for your application pool (w3wp.exe). If you’re running your service locally in your development environment chances are you are using IIS Express (iisexpress.exe). So what is the issue here? Well, things can go wrong if you misplace your initialization logic and/or configuration. It can be observed as a misbehavior or even a crash. Let me demonstrate a few examples of what can happen. Issues that I’m going to describe in this post are relevant to web roles only. 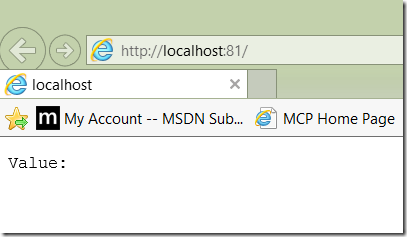 Worker roles are hosted by a single process (WaWorkerHost.exe). Before we start let’s create a simple cloud service containing a single web role. In Visual Studio select Azure Cloud Service template in the ‘New Project’ dialog, then add a single web role. 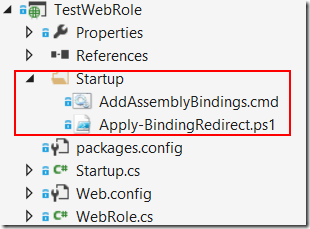 On the next page you will be presented with a standard one ASP.NET dialog where you can preselect components you need in your application. We’re going to select ‘Empty project’ as we want to focus on hosting. Awesome! Now we’ve got a harness set up. Hit F5 to verify everything works. Alright, you may think it’s clear. We just need to make sure we set things up in places that belong to the actual web application (Global.asax, OWIN start-up, etc) and we should be fine. In most cases yes but let’s have a look at another example. This one is going to make our role crash and recycle. Good, now we need to set up a sink. We can use out-of-process server that will capture events coming from ETW (Event Tracing for Windows) infrastructure but you may also choose in-process sinks. This is exactly what we’re going do now. Remember, we have two processes hosting our app and if we want to use logging in both of them we need to set up sinks in each process. Add and call this method to both RoleEntryPoint as well as to the OWIN start-up class. Change instance name from ‘TestWebRole’ to for example ‘WebApp’ when putting it in the OWIN start-up class. SLAB adds quite a bit of contextual information to logged events and instance name is one such extra bit of information. LogToWindowsAzureTable method accepts additional parameters like table name for instance. If we omit it it will create a table called SLABLogsTable. Note that it will only create a new table if it doesn’t exist. Otherwise it will be appending to an existing table. As I mentioned there is a lot of contextual information, you can add keywords to your events but what I really like about Azure table storage sink is that you can create create custom payloads for your events that will be serialized as JSON and also a column will be added per each property you want to include with it. Well, it runs well locally and we may not realize yet that we already have a problem. This is really frustrating because the emulator is letting us down. Let’s publish our service to Azure. Once published we are surprised to see that our role is recycling. SLAB table storage sink requires the storage library of version 3.0.2.0 but earlier we added this library directly from nuget and we pulled the latest version (4.3.0 as of time of writing). This is pretty common, we could as well have updated the storage package. To deal with versioning and updates there is a mechanism in .NET that allows you to specifying that an application that was built against a certain version of a dependency can use another version of that dependency. This is called assembly binding redirection. It basically tells an application built against the storage library of any version from 0.0.0.0 to 4.3.0.0 to use the latest version 4.3.0.0. But here’s the problem: web.config is going to be used by IIS worker process and it doesn’t affect WaIISHost process. Remember we added some logging to RoleEntryPoint and initialized an in-process sink for that. 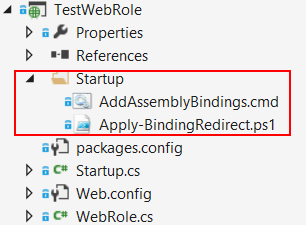 We want to add a similar assembly binding redirection to WaIISHost.exe but we can’t easily do that from our web project. 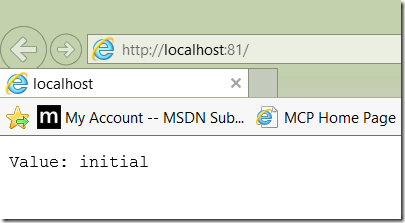 When you RDP to your role instance you can find the hosting applications in %ROLEROOT%\base\x64 directory. %ROLEROOT% is normally drive E: or F. The idea is to add (or modify if it exist) a configuration file for WaIISHost.exe assembly. We can do that with a PowerShell script that we are going to run as a Startup task for our role. It doesn’t do anything when you run the service under emulator and will run the PowerShell script when running in Azure. The PowerShell script is a bit lengthy to be posted here so I will just give a link to it. In fact that repo on Bitbucket contains the whole test solution I’m using in this post. That’s it. Redeploy the service to Azure and check if it’s working.